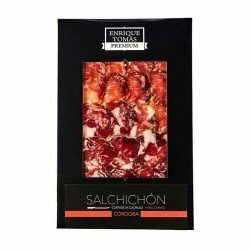 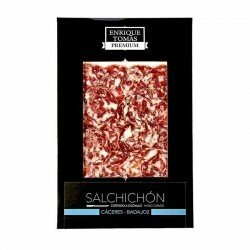 Half a piece of Salchichón Ibérico de Bellota, a typical Spanish sausage made with lean pork and spices, including black peppercorns, an ingredient that gives it its most characteristic flavour and aroma. 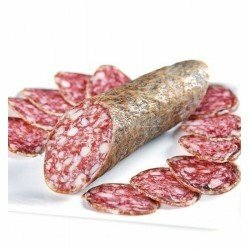 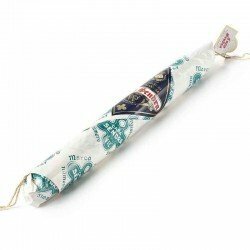 Enjoy 500 grams of exceptional sausage with a flavour full of character. Ingredients The "salchichón" is one of the most traditional sausages of the Iberian Peninsula. 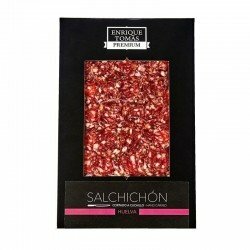 It is made using high quality meat, together with a mixture of spices in which the black peppercorns stand out, giving the product its characteristic aroma and flavour.